As this was my first character, I still have a lot to learn. This was an incredible learning experience as I got to use many different tools such as zBrush and UE4 for the first or second time. Overall, I think there are many ways I could improve the character in the future. I’ve never created concept art before and I find digital drawing very tricky in comparison to drawing ideas on pen and paper. I also feel I could have created more initial ideas for the concept; this may have created a more solid foundation. I found myself wanting to change various parts of the design throughout the process which could have been reduced with extra time being used in the concept stage. As I am still quite inexperienced at sculpting, I relied heavily on using simple geometric shapes and Dynamesh to create the various parts of the character. For example, the skulls started from spheres and the length of the staff from a cylinder. This technique may have worked well in this instance as my assets were mainly organic, however I feel I need to broaden my set of skills as I didn’t create any clothing for the character nor did I use techniques such as hard surface modelling or creating repeated geometries using Nanomesh. I found re-topology to be one of the more time-consuming parts of the pipeline. I know I could work on improving this part of the workflow as I struggled to create a good flow of topology around the tips of the fingers and toes as well as with the spines on the back of the character. In hindsight, I could have created more polygons for the spines or separated them completely from the body; I should have allowed myself to increase the poly-count for the sake of creating better definition between the skin and the spines. One thing I felt I managed to do quite well is reducing the number of polys used for the character. The total max tri count (this includes both weapons and character) is 27832, with the body only consisting of 12170 tris in total. I feel I could potentially reduce the poly-count of the equipment a bit more as it stands at 11714, however overall this character would be suitable within a PC or console game. I felt more comfortable texturing as I had prior knowledge of using Substance Painter and Designer. I really enjoyed using Substance Designer to create the scales material which I used to add extra detail to the normal map while also adding details to all the other maps that I used in Unreal. I feel I could improve the substance I created by adding parameters to control the order/disorder of the scales along with adjusting how close the scales were to each other. In total I used 4 different materials – this could have been potentially reduced to three if I had merged my feather material and equipment material together. This would have reduced the number of textures that the engine would have to load in and potentially optimise my model further. I was happy with how the feathers looked – originally, I tried to manually place planes to create a simple hairstyle, however this was very tedious and tricky to work with as I could not easily adjust planes. xGen was a much better choice as I could easily manipulate the size and shape of the feathers along with making a “poofier” hairdo that was easier to create and edit. I could have spent more time refining the shape of the hairdo itself, but I’m still very happy with the current result. I was quite comfortable creating the skeleton for the rig as I have created custom skeletons in the past. 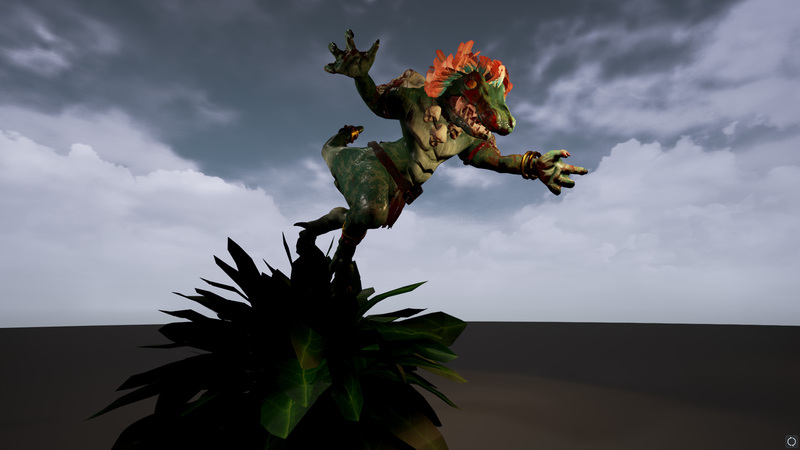 I enjoyed skinning the model and found that using extreme poses for my final renders helped to ensure that my model was properly skinned as I wanted to reduce unwanted deformations. One area I would like to work on is creating custom controllers for the skeleton. I mainly used IK handles for the limbs and tail and rotated the skeleton itself - this is not ideal for animation. In the future, I would spend more time polishing the rig so that it could be fully game-ready. 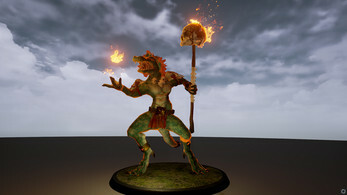 Unreal Engine 4 (UE4) was another one of my firsts. I found the material editor quite reminiscent of Maya’s Hypershade so it wasn’t too difficult to understand. One thing I did enjoy creating was the Fresnel emissive effect. I fell in love with the effect immediately and had to restrain when and where to put it. 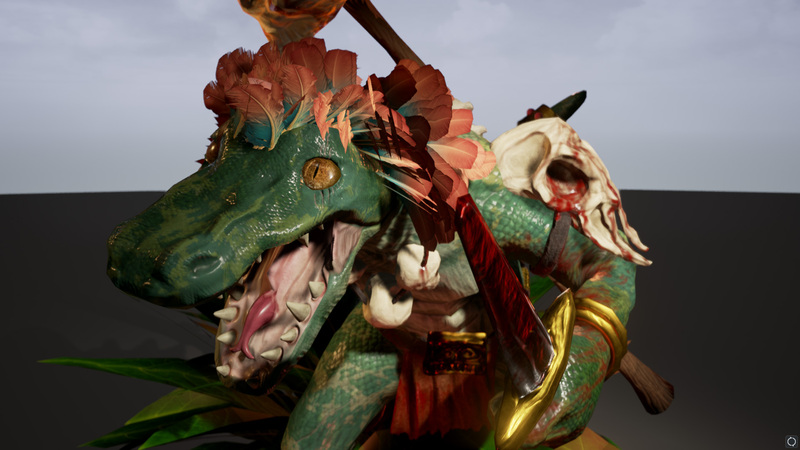 I decided it would be best to limit it to the skull of the staff or when the character was physically casting a spell along with the blade of the dagger to show how it glows when blessed by the Blood Serpent. There is still a lot I need to learn about UE4, but that will come with more practice. 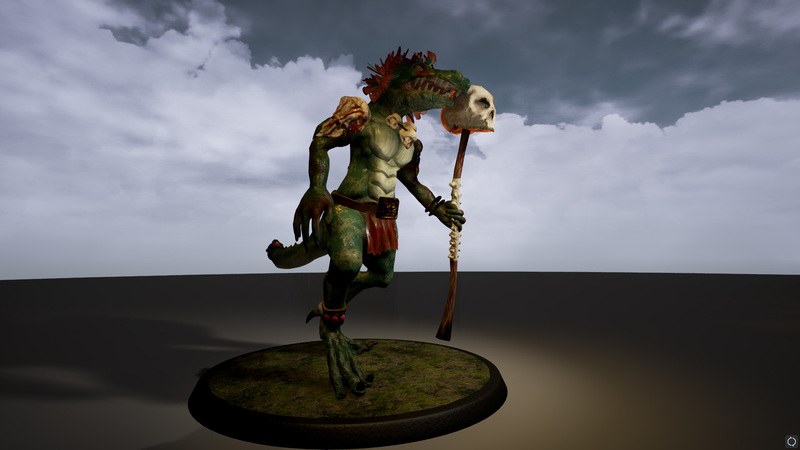 Overall I am happy with how the character has turned out and can’t wait to put the skills I have learnt by creating the Lizardman into practice once more. Unzip file and click on UE4 project. To view cinematic and view models in engine please play project as a game.